Situated on France''s Cote d''Azur, Cap Ferrat was described by Somerset Maugham as ''The escape hatch from Monaco for those burdened with taste''. John Kingsley has captured the gorgeous blue of the sea and the sunshine and light that attract so many people to the coast. A long-standing member of the Glasgow Art Club and Group 81 John Kingsley has established a reputation as a leading Scottish contemporary artist. 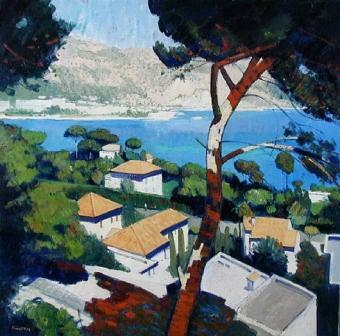 He shows his skill with colour, light and shade in ''Cap Ferrat''. In addition to Red Rag Modern Art Gallery John Kingsley has exhibited at other leading Scottish Art Galleries including the Royal Glasgow Institute, Royal Scottish Academy and the Paisley Institute. Each painting at Red Rag is sourced from the John Kingsley artist studio and like all Red Rag Scottish art and Modern art it can be shipped worldwide. Click here to view more contemporary paintings by John KINGSLEY PAI RSW .